The cwz file extension is associated with the Pogoshell, a file manager for the Gameboy Advance that allows users to manage filesystem on handheld. The cwz file contains some kind of data used by PohoShell. 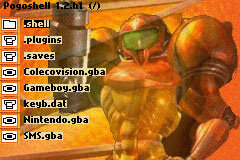 Pogoshell is file manager for Nintendo Gameboy Advance gaming handheld console. Pogoshell also includes a much better save management system than most flash cart frontends provide. Click on the software link for more information about Pogoshell. Pogoshell uses cwz file type for its internal purposes and/or also by different way than common edit or open file actions (eg. to install/execute/support an application itself, to store application or user data, configure program etc. ).